In food, there’s nothing new under the sun. It’s really difficult to be original. Whatever blinding flash of inspiration you think you’ve had, I promise you that it has been done before; usually better, sometimes worse. If it hasn’t been done before, then that’s usually a good indication that it’s not such a great idea (i.e. it was done before and discarded because it wasn’t fab at all). If it was fab, we’d have heard about it in the last 5000 years. This goes for top-level chefs as well as for the humblest baker. That being said, there’s nothing wrong with tweaking a recipe and putting your own spin on it. Tweak it enough and then you can claim it as your own (and acknowledge the inspirational recipe, but it’s surprising how many people seem to forget this bit). Example: Ian Dowding and the invention of Banoffi Pie. Except, of course, he didn’t invent it, he readily admits that it evolved by adding bananas to a recipe for Blum’s Coffee Toffee Pie brought back from the US by Russell the chef, with whom Dowding worked in a restaurant in Berkshire. Read all about it here. And so to this week’s recipe. I recently watched an episode of a food show from the US and one of the items shown was a Goat’s Cheese and Blueberry Pie with fresh basil. I liked the unusual combination and re-watched the clip several times in order to jot down what looked like the quantities/ingredients. It took a couple of tries to get the sweetness and texture right, and my overall verdict was: No. The goats cheese was odd. The tart lacked zing. The fresh blueberries were OK, but had no pop of flavour, and so I set my notes aside. Until I had a brain wave a couple of weeks ago with: blackcurrants! I resurrected my notes and swapped in blackcurrants for blueberries and it was amazing (she said modestly). The fresh basil is very reminiscent of the aroma of blackcurrant leaves and the amazingly tart pop of flavour from the berries was just what had been missing from the original. After guarded compliments from friends after the first attempt, I swapped the goats cheese for cream cheese and found I didn’t miss the lack of tang at all. – it was creamy, but not so dense as to push it into cheesecake territory (although it’s close!). Disliking unnecessary waste, the surplus egg-white from the filling ended up in the topping, along with butter instead of margarine, which all made for a crunchy variation to the original. Finally, there was a need to balance out the basil: the boldness of the blackcurrant flavour meant a larger quantity was needed in order for it not to be lost in the background whilst avoiding being too heavy handed and tipping it over into a borderline savoury tart. Luckily, the perfect amount was almost exactly the quantity of leaves you get in a 28g pack of fresh basil in the supermarkets. Interesting Fact: I read recently that blackcurrant is, for the most part, an unknown flavour in the US, due to a ban in the early 20th century when it was thought to harbour a disease harmful to the logging industry. All can say is: you’re missing out, my friends across the water, and it’s high time you invested in blackcurrant bushes in order to enjoy all the wonderful things you can do with them. Exhibit A: this pie! If you’re lucky, you will be abe to find frozen berries in your supermarkets and farm shops until your bushes bear fruit themselves. So yes, I did not conjure this fabulous tart up out of thin air, I evolved it from something else. That doesn’t mean it’s not fabulous and you should all rush out and get some blackcurrants immediately. If nothing else, for the vitamin C, doncherknow. “But where!? It’s March!” I hear you wail. If you’re not lucky enough to have some in your own freezer from the bounty of last summer, then (in the UK) some supermarkets have them in the frozen fruit section. You can also find them in farm shops that have large chest freezers, alongside other berries and fruits in a kind of scoop-your-own setup. I’ve opted for a pastry crust, but you could just as easily use a cheesecake-like, biscuit-and-butter crumb instead. Fresh basil is a must – don’t even think of trying to fudge it with dried. Whisk the cheese until smooth, then add the egg, yolk, sugar and cornflour and mix thoroughly. Stir through the shredded basil and the blackcurrants. The blackcurrants can be used frozen, just make sure they’re not all stuck together in a big lump. Pour the filling into the prepared tart case. Whisk the sugar and egg-white together, until frothy, then stir through the almonds. Add the cooled butter and mix thoroughly. Pour the topping evenly over the filling. Bake for 35-40 minutes until almost set, and the topping is golden brown. Allow to cool, then chill thoroughly before serving. Back in January 2015, I introduce you all to Drowned Doughnuts, a wonderfully light and flavoursome dough that had the unusual method of being proved in water (hence the ‘drowned’). At the time I mentioned that I would be returning to the dough at some point, for use in another recipe, and so here we are. Yes, I know it’s been two years, but I’m rather bad (or should I say, very good) at getting distracted. Drowned fruit tart is deliciously adaptable to whatever fruit you have to hand – the usual filling is stewed apples, but I happened to have some beautifully coral-coloured, stewed Warden pears in the freezer, so went with those. The quantity can be dictated either by what you have to hand or by the shape of your tin for, as can be seen in the picture, any excess dough can be made into the aforementioned doughnuts. With a small addendum to the original recipe. Anecdote Deviation: I like to think that I know a bit about a few bits of baking, here and there, and can usually deduce how something has been put together, and frequently the general method. There’s a pub nearby that we like to eat at, and their bread game is ON POINT! The pizzas are hand thrown and baked to order, and each table is brought a basket of freshly-baked rolls as an appetiser. Nice! My daughter is obsessed with these rolls, and secretly so was I, although I played it cool. These rolls are the softest, most pillowy balls of fresh-baked dough I have ever eaten. And, frustratingly, I couldn’t work out how this was achieved. My understanding of the best way of achieving soft rolls has been tweaked over the years as I have picked up snippets of information here and there, and until recently consisted of: mix dough with half milk, half water, brush baked rolls with milk when they come out of the oven and allow to cool in a clean cloth, thereby trapping the steam and softening the crust. Even crisp mixed-with-water-only rolls will soften after such treatment. What was nagging at me was the fact that the pub rolls were obviously baked to order and brought to the table hot from the oven and yet they were so soft, so tender – I couldn’t work out how it was done. Each visit would be followed by experimentation of one or two batches only to get the thumbs down from my daughter, so on a recent visit I decided to be BRAZEN and when the server approached the table with the (now legendary) basket of hot rolls and the question “Can I get you anything to start?” I looked him straight in the eye and said “The recipe for these rolls, please!” I know. Shameless – but I was desperate! Bless his heart, he was back 10 minutes later with a hand-written recipe from the chef. Eagerly I scanned the recipe for the magic touch. Did he add cream? Maybe the rolls contained lard, or margarine. Oooh! Oooh! Could it be milk powder!? No. The one thing that differed from a perfectly ordinary bread dough recipe, the magical touch that set these rolls apart from all other efforts was – the rolls were brushed with melted butter before baking. I must confess to being more than a little skeptical – I was familiar with the technique of brushing hot loaves with butter AFTER baking, sure (popular in Russia, Ukraine, etc) – it makes loaves beautifully glossy and burnished – but before? Nevertheless I was prepared to give it a go and brushed over melted-but-cooled butter on the batch I whipped up the very next day. And they were perfect. I couldn’t get over how perfect they were, how pillowy, billowy soft. My daughter was overjoyed. Which is why, when making the leftover dough in this recipe into balls (as opposed to cutting them out originally), I brushed them with melted butter before baking. They turned out fantastically soft (*points at photo* See! SEE how lovely they look!) and, tossed in caster sugar, hot from the oven, about as close to a guilt-free doughnut as you can get. All of which leads me ramblingly to this point: you’re never too old a dog to learn a new trick. The tart. The extra little touch for this tart, aside from using sweet, vanilla-scented dough in place of pastry, is the treatment after it emerges from the oven. You spoon – or in my case pipe (fewer stray splodges) – sweetened sour cream/creme fraiche between the dough strands, directly onto the fruit filling and allow it to cool. The cream slowly thickens to a cheesecake-like texture which goes fantastically well with the sharp, fruit filling and the sweet dough. I also brushed the edges of the tart with melted butter, to keep them soft. I used clarified butter, for a more even colour (milk solids might bake as darker spots). And finally, you don’t HAVE to let the dough rise in water, it will still rise just fine in a bowl. Grease and line a baking tin with parchment paper. Make sure it is deep enough to contain a decent layer of fruit filling. I used 500g of pears for the tart in the photo – on reflection, 1kg would have been even better. Roll out the risen dough to a thickness of 1-1.5cm. It will obviously rise during proving and baking, so you don’t want to start too thick and then end up with something less-than dainty emerging from the oven. Line the tin with the dough and allow any excess dough to drape over the sides. Spread in your fruit filling evenly. Trim the excess dough and re-roll the trimmings to make lattice strips. I opted for thin strips, twisted into ‘barley-sugar’ shapes. Lay the strips diagonally across the tart to form a diamond lattice. Dampen the edges of the dough and fold them down and over the ends of the lattice strips to keep them in place. Crimp the edges of the tart neatly. Brush the edges of the tart and the lattice strips with melted, cooled butter. Allow to prove while the oven heats up. Bake until risen and golden. Depending on the size of your tart, this will be between 25-40 minutes. While the tart is baking, divide any remaining dough into 30g pieces and roll into balls. Set onto a lined baking sheet to prove. Mix sugar into the cream/creme fraiche to taste. I usually under-sweeten with just 50-60g of sugar. Spoon into a piping bag if liked. When the tart is baked, remove from the oven and fill the lattice spaces with the sweetened cream. Set aside to cool for 3-4 hours. Serve at room temperature. For the doughnuts: When risen, brush with cooled, melted butter and bake for around 15 minutes. Whilst hot, toss in caster sugar and set onto a wire rack to cool – or consume immediately, your call. I’d like to introduce you to a rather fabulous multi-purpose ingredient, developed and created in the L’Ecole du Grand Chocolate Valrhona test kitchens: Namelaka. It was actually developed several years ago, but seems not to have caused much of a ripple since then, with the exception of in Italy, where it appears to be very popular. It’s name (pronounced namma-lakka) comes from the Japanese for creamy/smooth and it is a fabulous cross between a ganache and a crème pâtissière. It has the smoothness of a pastry cream, but the richness of a ganache and can boast a whole host of uses. As you can see from the photo, it holds its shape beautifully when piped, which makes it perfect for tart and pastry fillings and decoration. It is especially fine in filling choux pastry items such as eclairs, profiteroles, cream puffs and croquembouche. You can use it to decorate the tops of cakes or to sandwich them together, both large and small, and it can also be served as a dessert itself, in small, ladylike portions, with some granola or crushed biscuits adding texture. One of the great aspects of namelaka is the possibility of adding additional flavours to complement the finished cream by infusing the milk before use. What you use is limited only by your imagination: the zest of any of the numerous citrus fruits, instant coffee granules, freeze-fried fruit powders, teas, freshly ground spices, tonka bean, praline… the list goes on. The only downside of namelaka cream is the need to make it a full day before required, as it needs time to chill thoroughly before use. For serving in its most light and delicate form, I recommend just a single leaf of gelatine and using whipping cream. An almost mousse-like consistency can be achieved by using 2 leaves of gelatine and double cream, and then whisking it briefly after chilling overnight. Melt the white chocolate in the microwave or in a bowl over simmering water. Put the sheet of gelatine in cold water to bloom. Heat the milk and glucose in a pan until almost boiling. Add the bloomed gelatine to the milk and stir to dissolve. Pour 1/3 of the hot milk mixture onto the melted chocolate and stir to incorporate. Add the remaining milk and repeat. Add the whipping cream and mix thoroughly. Briefly use an immersion blender to ensure mixture is thoroughly amalgamated. Cover with cling film and chill for 24 hours before using. If using 2 sheets of gelatine and double cream, whisk briefly after chilling before use. Or not. As you like. For flavouring with citrus: Use the zest of 1 fruit in the milk and allow to infuse for 15 minutes once heated. Strain out the zest and reheat before mixing. For flavouring with Tonka bean: ½ a bean grated on a microplane is plenty. Infuse as above. For spices: Use whole spices for preference (easer to fish out) and infuse as for the citrus zest. I love a good cheesecake. I don’t, however, love ALL cheesecakes. No, to my mind, if you’re going to elaborate on the indulgent simplicity of flavours such as vanilla or maple syrup, cheesecake needs something sharp to act as a contrast to the richness of the filling. So I say “Away, foul fiend!” to a whole slew of flavours that, to my mind, shouldn’t be paired with cheesecake, mostly in the chocolate, toffee, Banoffi, caramel, praline range, and “Come to Mama!” to all the tart and sharp fruity flavours. Lemon cheesecake was a long-term favourite, but anything that has a sharpness to it is delicious. There are two main styles of cheesecake: baked and no-bake. I’ve got several recipes on the blog for various baked cheesecakes but haven’t done a no-bake cheesecake, so here we are. After a little experimentation, I’ve come up with something that will work for any fruit puree you might have to hand. I’ve used gooseberries, but you could also use this recipe for poached rhubarb, plums, damsons as well as raw fruit purees such as strawberries, raspberries, cherries etc. Another way you can customise this recipe is by swapping in ingredients that will give a texture that you like. A baked cheesecake is usually rich and dense, whereas no-bake cheesecakes tend to have a lighter texture as they rely on gelatine to hold their shape once set. The filling for the cheesecake in the photo has been made with equal parts of mascarpone, creme fraiche and double cream mixed with the fruit puree, which makes for a creamy but still light texture. If you prefer a denser consistency, you can substitute cream cheese for the mascarpone or creme fraiche or even both. Quark is a fat-free dairy product, but might take the texture towards a mousse rather than a cheesecake. Nothing wrong with that at all, of course, as long as it’s what you were wanting. A word or two about gelatine. At the risk of stating the obvious, gelatine renders your dessert off-limits to vegetarians. Whilst this might be your dastardly plan, you can still make this dessert so all can enjoy. Vegetarian gelatine is generally available, but not in the sheet form used in this recipe. You should follow the vege-gel guidelines for blooming and using it in your dessert. The other thing to bear in mind, whichever form of gelatine you use, is that it’s not very fond of acidity. Using the quantity stated on the pack to set a very sharp, acidic liquid is not going to be as firm as if the liquid is neutral in flavour. You might like the texture, but as a general rule, I would advise using extra gelatine to ensure your dish sets as expected. For example, the recipe below generated 300ml of gooseberry puree. Normally, 2 sheets of gelatine will set 300ml just fine. I used 4 sheets of gelatine a) because of the sharpness and b) because of the volume of filling into which it was to be mixed. The mixture of creams and cheese is quite stiff when whisked together, but adding the puree slackens the mixture off considerably. Having the extra gelatine in the puree meant that all of the filling set, once it had been folded through. In contrast, for the gel on the top of the cheesecake, I only used a little extra gelatine, which resulted in a much softer final set. For leaf gelatine, 1 leaf will set 150ml of liquid. Powdered gelatine and Vege-gel are sold in packets that usually set 1 pint (570ml) of liquid. Weigh the granules and divide by four for an equivalent guideline amount. Last topic before we get on with the recipe – the biscuit base. You can make this from a range of commercially produced biscuits or make your own. Traditionally the biscuit has been Digestives, but other (British) types include HobNobs, Ginger Nuts, Butter Crinkles, Rich Tea – anything crisp. 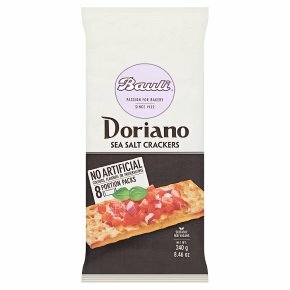 I’ve even used Doriano crackers (similar to Saltines), which give a deliciously unexpected saltiness as well as crunch. For this recipe I have chosen to use a crumb of Spekulaas, the traditional Dutch Christmas biscuits. They are definitely crunchy and add a nicely spiced note which complements the gooseberries. Any favourite crisp biscuit can be used, merely bake the dough in its breadcrumb-like state and blitz in a food processor when cooled. You can use either green or dessert gooseberries for this recipe. Green gooseberries (see photo at the bottom of this post) ripen earliest, and pair very well with elderflowers. You can substitute half the poaching water with elderflower cordial if liked. Dessert gooseberries are sweeter and with a rosy blush which makes for the beautifully coloured topping in the top photo. These quantities makes a large cheesecake, so if that doesn’t suit your needs, consider halving the recipe. 2 tbs speculaas spice mix – or a mix of cinnamon, nutmeg and ginger, as liked. 50g unsalted butter – melted. Heat oven to 175°C, 150°C Fan. Line a baking sheet with parchment. A sheet with a lip will help keep the crumbs contained. Put all the ingredients except the melted butter into the bowl of a food processor fitted with the blade and blitz until the mixture looks like breadcrumbs. Tip the crumbs onto the baking sheet and spread out evenly. Stir the crumb, breaking up any large pieces and then return to the oven for a further 10 minutes. Pour the cooked crumb into the bowl of a food processor and pulse until the mixture is of an even and uniform crumb. Tip the crumb into a bowl and pour over the melted butter. Mix thoroughly until the crumb resembles damp sand. Press firmly into your chosen tin. I used my rectangular springform tin (28cm x 10 cm) and pressed the crumb up the sides a little to give a little extra support to the filling, but if you’re confident in your gelatine levels, this isn’t necessary (see photo at the bottom of this post). You might like to line your tin with foil or parchment to help remove once set. Put the gooseberries and the water into a pan over a very low heat. Cover and allow to gently simmer until the fruit is soft. Stir gently from time to time to prevent the fruit from burning (10-15 minutes). Pour the fruit mixture through a sieve. Leave to drain. Keep both the liquid and fruit pulp. Bloom the gelatine in cold water. Sieve the drained fruit to remove the seeds. You will get about 300ml of puree. If you have extra, set it aside and serve as sauce with the cheesecake. Put the puree and bloomed gelatine into a saucepan and warm gently until the gelatine is melted. Taste and stir through just enough icing sugar to make it slightly sweet. Put the mascarpone, creme fraiche and double cream into a bowl. Add 3 heaped tablespoons of icing sugar and whip until the mixture is firm. Taste and add more sugar if necessary, but it should only be slightly sweet. When the fruit puree has cooled, but is still liquid, fold it into the whipped cheese/cream mixture. Taste the mixture to check the sweetness levels and adjust as needed. Pour the cheese mixture into the prepared tin. I lined the edges of the tin with acetate which allowed the filling to come up higher than the level of the crust, but this isn’t compulsory. Cover lightly with cling film and allow to set in the fridge (2-3 hours). Measure the retained juice from cooking the fruit and calculate how much gelatine is required to set it. I set 400ml of sharply-flavoured juice with 3 leaves of sheet gelatine. I like the soft set, but you might prefer something a bit firmer in which case add another gelatine leaf. Stir in enough sugar to sweeten slightly. I prefer to keep the topping quite sharp as it provides a great contrast with the sweet biscuit base and the creamy filling. Bloom the required quantity of leaf gelatine in cold water. When the cheesecake filling has firmed up, add the gelatine to the juice and warm until the gelatine has melted. Cool slightly, then gently spoon over the cheesecake. Be careful not to pour from a great hight, as you might disturb the surface of the cheese filling and this would make for a cloudy jelly layer. Return to the fridge and chill until set, preferably overnight. Green Gooseberry Cheesecake – an earlier version with base-only crumb.